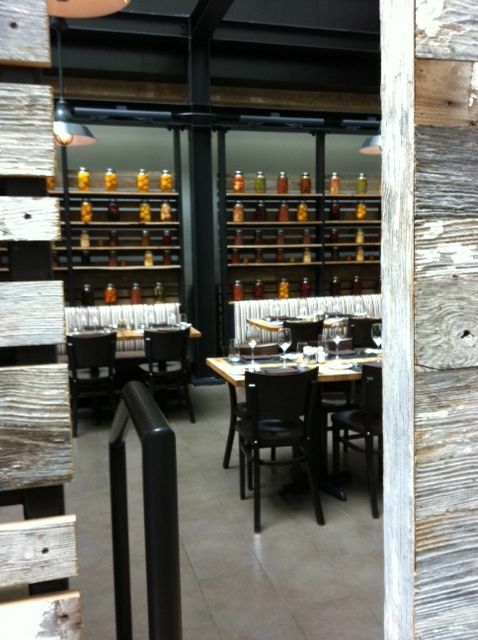 Urban Farmer is located in downtown Portland by Pioneer Courthouse Square in the Nines. Great location if you are visiting from out of town and a great restaurant for a hotel restaurant. 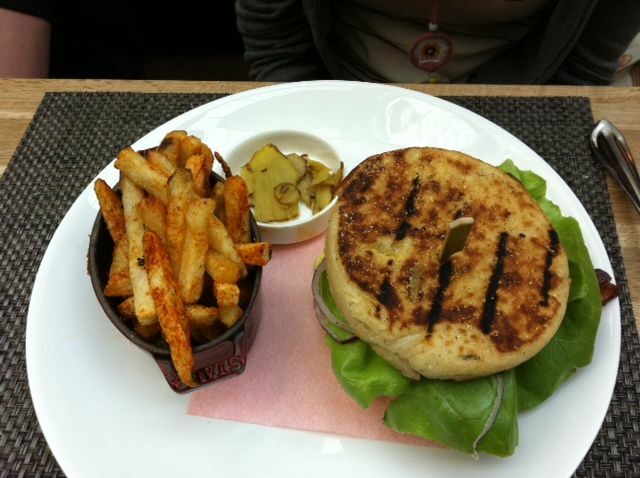 We went for lunch, because to be quite honest, the dinner menu is way to expensive. But thanks to lunch options we can still try any place around town. For starters many people like the look and atmosphere, but me, it felt too much like a hotel, although they did add some great touches like the room of canned fruit and cow print benches. I also did like the fact that the tables were very far apart giving you more of an intimate dinning experience. But the atrium and hotel rooms lining the walls screamed hotel and I couldn’t let it go. Just know my husband thought it was fine. We started by ordering a few salads. I got the iceberg salad with apples and it was so good. Different than anything I have had before. 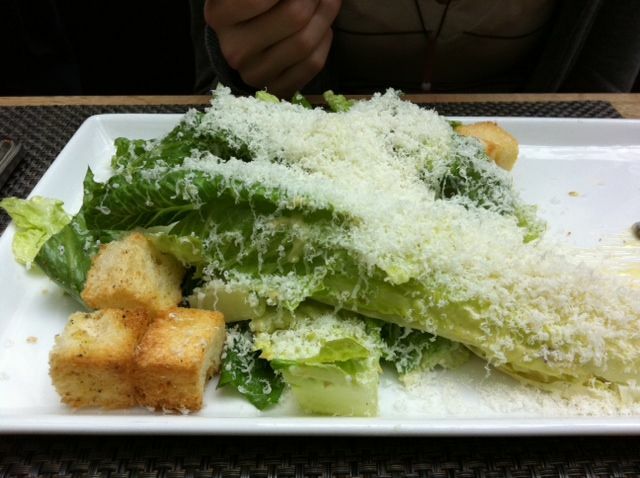 My kids ordered the ceasar salad and my husband shared with them since there were so big and so were the croutons…huge. Grits, shrimp, pulled pork and an egg!! 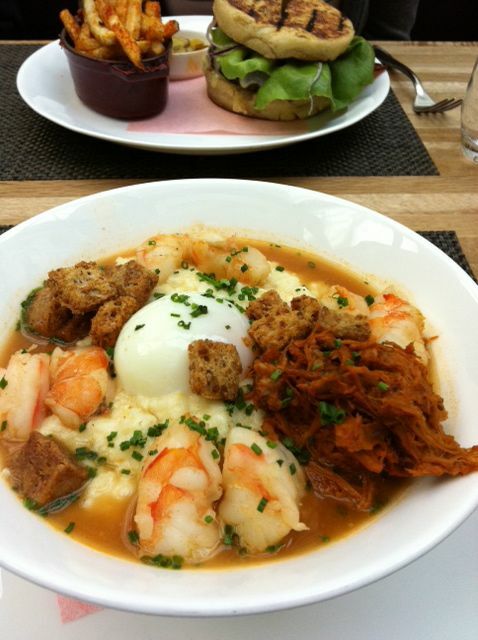 I ordered the grits with a poached egg, spiced shrimp and pulled pork. It sounds so incredibly weird, but I had a friend tell me how awesome it was. Still questioning, yet wanting to try it, I grilled the waitress about it’s splendor and she recommended it as well and said I wouldn’t be disappointed. I was NOT disappointed. One rule I try and follow when I am out eating is trying things that I would never make. This is something I for sure would never make. To many elements to many ingredients. My man got the steak frittes. There were good as well. 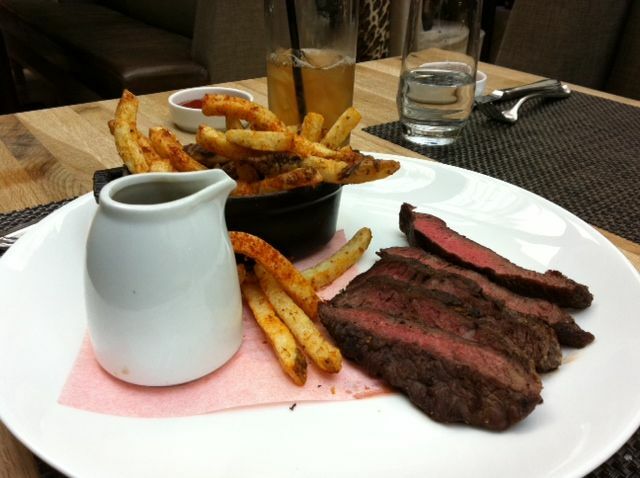 The steak frittes and the burgers both came with fries that I think had paprika sprinkled on them. My daughter did not like them, everyone else thought they were fine. Atmosphere was very different than anything I have seen in Portland. It seemed quiet, with very quaint settings for each table. Bar was super cool. Price was around $13 a meal for lunch. For dinner a steak will set you back $40-$60. Ouch!! We didn’t order any drinks, see I’m not a lush, I don’t always drink at lunch time. Although they do have Hopworks and Laurelwood both on tap as well as others and quite a list of bottled beers. There is a wine list and cocktail list as well. Service was exceptional, but we were also there at 1:30 for lunch and it was quite empty. Downtown Portland in the Nines next to Macy’s across the street from Pioneer Square.